Note: This week is International Quilt Market, a trade show in Houston, Texas, for the quilt and sewing industry. Kreinik will be there in booth #2447, selling our machine sewing threads and showing the beautiful quilts of this Canadian artist. On his summer vacation, Doug Kreinik pointed his car in the direction of beautiful Nova Scotia. He stopped in quaint towns, visited needlework shops, toured the sites, and met interesting people. 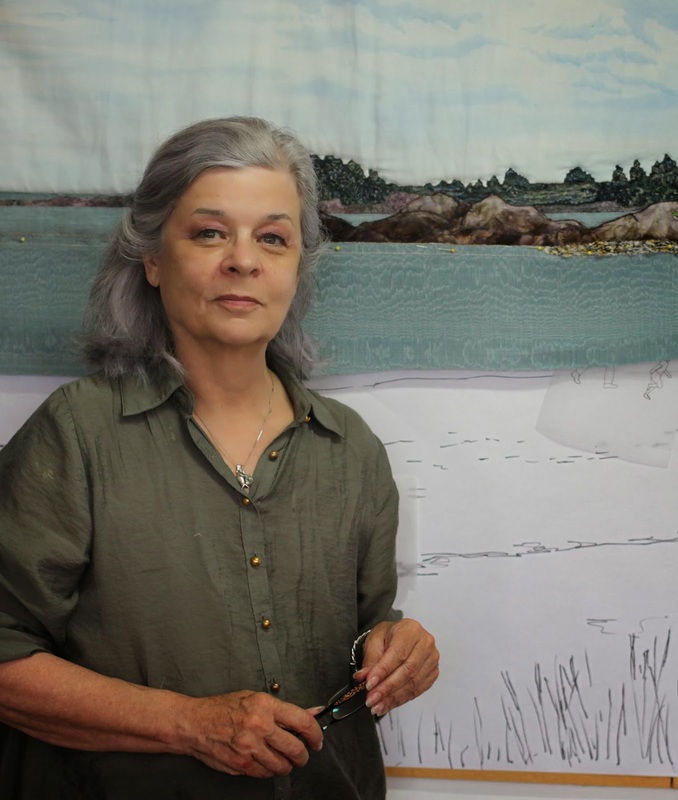 On such Nova Scotian was Laurie Swim, a quilt designer and award winner. She has won many awards for her "documentary qulits" celebrating working people and some of the dangers of various jobs like ocean fishing and coal mining. "She has a beautiful gallery," Doug said. "Many of her pieces and commissions were designed from photos of different sites and scenes of the beautiful coast lines and little harbor inlets of Nova Scotia. Myla and I were often taken aback by the beauty of the countryside and the wealth of history and hard times faced the people." 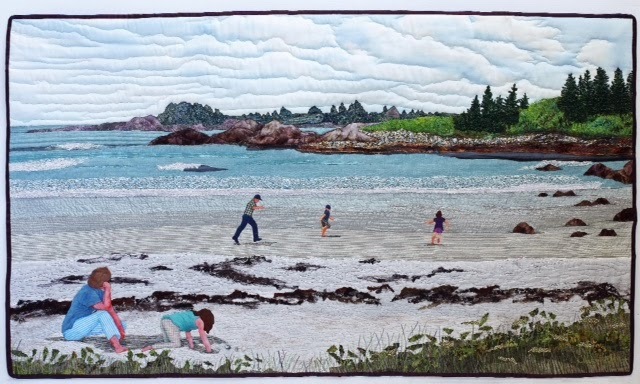 Laurie's projects include private commissions and large-scale community quilts. 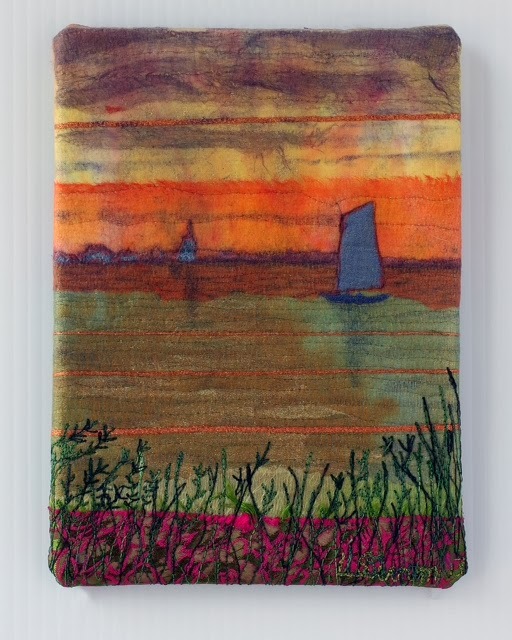 She has written several books on quilt art, and her latest is "Rags to Riches: The Quilt as Art." Kreinik will be featuring quilts by Laurie in the Kreinik booth at this month's International Quilt Market, and will be selling copies of her book. There is always something to learn from a needle artist, no matter their medium, skill level, geographical location, etc, so this week we'd like to share our interview with Laurie. 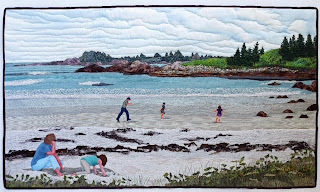 To learn more about her quilts, visit www.artquiltpublishing.com. Q: What does "art quilt" mean to you? A: I often debate this question with myself. I think simply that it is an art object which uses the concept of the quilt among other things, to deliver the artist's vision. Q: When did you start quilting? Were you influenced by anyone in your life, events, or places in your life? A: Making quilts in the small community of Lockeport, Nova Scotia, where I grew up, was a traditional pastime. I liked sewing from an early age and I made my first quilt when I was 16. My ambition had always been to become a painter. After graduating from the Nova Scotia College of Art and Design, I began experimenting with fabric and thread as a medium. My first art quilt, Eve's Apple, was entered in the Nova Scotia Craft Council juried show in 1976. The juror, Alex Colville, a renowned realist painter, awarded the work Best in Show. Years later, he kindly wrote a glowing introduction to my first book, The Joy of Quilting. Eve's Apple graced the cover. Q: Your quilts are like paintings, but very textural. How do you combine fabric and thread to make them so visually interesting? A: Recently, a friend reminded me that I use the same technique in my work that painting often employs, that is, laying down color (pieces of fabric) and blending them (thread play) using free motion on the sewing machine as a drawing tool. The only time I use paint or dye, messy stuff, is when I need to create a sky or water. Q: Which Kreinik threads do you use? 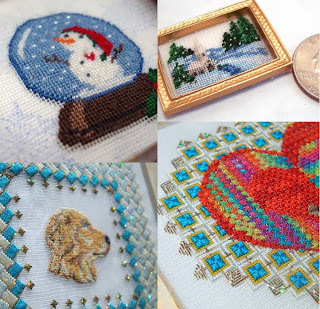 A: At the moment, I am experimenting with many of the metallic threads Kreinik offers. I am particularly impressed with the quality of the fine sewing thread and how it easily flows through the machine. In the past, I have found metallic threads frustrating and have avoided using them. Now I am free to accent my work with metallic highlights. Q: Do you have tips or suggestions for using specialty threads like metallics? A: I generally set them in a cup behind my machine and thread them through the eye of a safety pin I have taped to the side of my machine. I bet many of your readers have better suggestions. Q: Many of your quilts have historical themes, inspired by actual events. So beyond being fiber art, your quilts are storytellers. How do you select the story to document? Are you inspired by politics, issues, setting, region, emotion, sociology in the story? A: All those things. It is usually a collision of ideas and events. I have to relate to the subject emotionally to give it life in my work. Q: Tell us about some of your community quilts. A: I have created 6 large scale community built quilts for social activism and historical record. They were initiated and designed by me and made with volunteers from the community. This interest began almost twenty years ago when at the time I felt isolated within my art making and wanted to be part of or involved with a larger community. I was living in rural Ontario outside the larger centre of Kingston, Ontario, when I happened upon a grant for Art in the Workplace that was offered by the Ontario Arts Council at that time. I contacted the local Kingston and District Labor Council to see if they were interested in doing a project with me. They were and we began our association with making a labor banner. The following year we submitted another proposal to do a larger more important historical work commemorating the builders of the Rideau Canal, which runs between Kingston and Ottawa through the Canadian Shield. It was an amazing construction achievement accomplished between 1828 and 1832 by itinerate Irish workers under dire circumstances. I titled the 9' x 15' work, made of thousands of thumbnail pieces of fabric, Pulling Together, The Builders of the Rideau Canal, 1828-32. The experience enlightened me as to how the vulnerable are taken advantage of and that politicized my work. My family moved from Kingston to Toronto where I undertook another history project to mark the amalgamation of the Toronto boroughs in 1998. Then came the opportunity for an even larger community built quilt as a millennium project commemorating an important part of Canadian labor history. The death of five Italian immigrant men in 1960 who were digging a water main tunnel for the city of Toronto, outraged the community. That tragic event led to safety regulations on construction sites in Canada, saving many lives. Breaking Ground, The Hogg's Hollow Disaster, 1960, 7' x 20' is now permanently installed in a floor to ceiling glass case in the York Mills Subway Station near the location of where the incident took place. Also in 2000, I spent the summer in my hometown creating the memorial to the tragic loss of 17 fishermen that devastated my community in 1961 leaving 16 widows and 65 children fatherless. Lost at Sea was a project close to my heart and began my journey home to Nova Scotia. Following that, I undertook a very emotional and more currently problematic project, The Canadian Young Workers Memorial. Volunteer sewers and I created 200 hundred commemorative pieces, one set for the memorial and another for the family of each of the 100 youths between 15 and 24 years of age who died on the job. In 2003, after completing this work, I was invited by the Lunenburg Heritage Society and the South Shore Tourist Association to create The Lunenburg Heritage Story Quilt in the public eye during the celebration of the 250th founding of Lunenburg, a UNESCO World Heritage site. The following year, my husband and I made the decision to move here permanently. A: The most important suggestion I can give to someone thinking of initiating a community project is to engage a person or persons to be the core champions of the project. Usually, this means they are personally invested in the project and committed to seeing it through. The artist is the visionary and the one who figures out how the work will be made. Surrounding yourself with people who believe in the project gives it the moral centre needed to imbue it with meaning. In practical terms, although the artist is in charge of the final outcome, the input of those supporting and working on it makes it a richer experience as well as a powerful outcome. Q: Do you create privately commissioned pieces, such as quilts from photos, memorabilia, etc? A: I do commissions occasionally. I just finished one for the daughter of one of the fishermen who I commemorated in Lost at Sea. It was a scene of Lockeport Crescent Beach, a subject we were both familiar with. I think that is the key to doing a commissioned work. It has to be a subject that touches both the artist and the recipient of the work. I have worked from photos and included incorporation of memorabilia on occasion. Q: If you didn't have a life lived in the arts, what would you be doing? A: I have no idea as I have always thought I would be an artist. Whether that is a calling or a compulsion, I don't know. I do know I would be less happy if I did not try to lead a creative life. 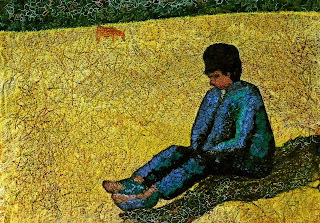 • Peasant Boy (After Suerat), 9"x12", Laurie Swim, 2013 (About the Kreinik threads in the piece: "I couched a strip of yellow [Micro Ice Chenille] into the line dividing the field from the tree line to accentuate it. 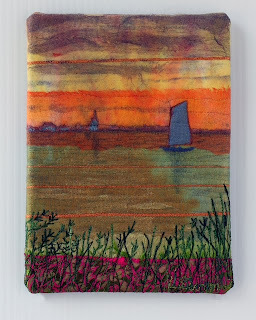 I also stitched some of the fine gold thread throughout the field to make it glisten." As you stitch holiday projects for gifts or home decor this year, are you getting bored with the same old fabrics? Another ornament on 18-count mono canvas…or natural brown 28-count linen again… While these fabrics are staples in any stitching studio, it's time to try something new, or well, new to you. How about silk gauze? Silk what? Kreinik sells silk gauze in all sizes, and it's a top secret needlework fabric. Well, not really, but most people haven't heard of it. In fact, however, this sheer, open-weave fabric made of pure silk was pretty common in historical needlework. Our fore-stitchers had silk, they knew how to weave, and they put the two together. It was sheer, lightweight but sturdy, strong, and you could embroider on it. It was good for clothes (a silk gauze robe was found in a tomb dating to 800 BC) and for samplers (Sampler and Antique Needlework Quarterly recently featured a design that a 9-year-old stitched in silk thread on 55-count silk gauze, in 1806). It's strength and lightweight qualities made it useful for many embroidery applications over the centuries. Today silk gauze is primarily used by miniaturists to make doll-house sized versions of needlepoint pillows, rugs, bellpulls, and samplers; 40-count silk gauze is perfect for 1-inch to 1-foot scale. However, cross stitch designers like Erica Michaels Designs have started using silk gauze as alternate fabrics for stitching any kind of design. Finished silk gauze stitchery fits into jewelry findings or miniature frames. It has become the go-to fabric for "something different." Problem: "I can't see to stitch on silk gauze." Problem: "I'm a cross stitcher, and I've never stitched on silk gauze before." Solution: Start with a size that you are familiar with; if you normally cross stitch on 28-count linen, start with 28-count silk gauze, for instance. Don't attempt an heirloom right away. 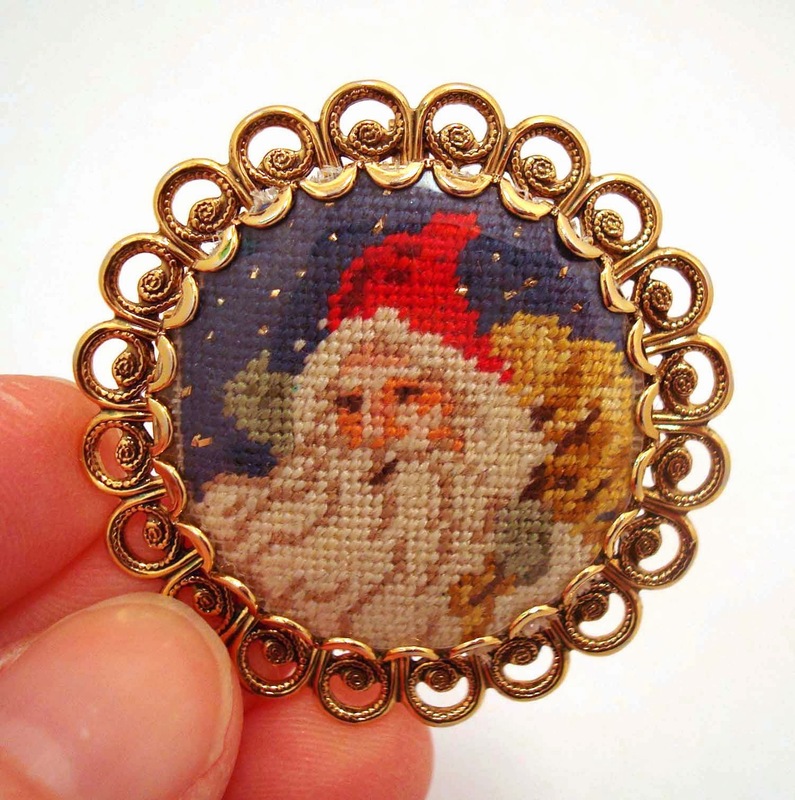 Try one of the free designs on the Kreinik website, or any basic, small design. 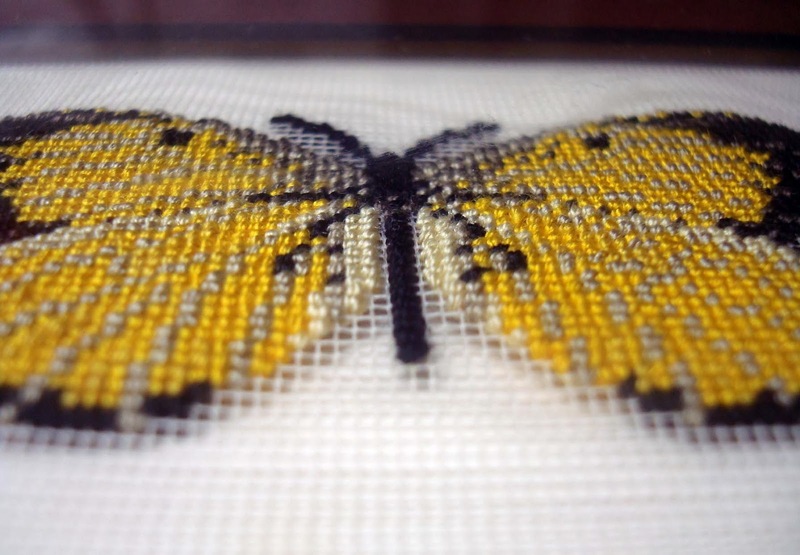 Almost any charted cross stitch design can be used for silk gauze stitching. Pick a design without quarter stitches, blended colors, backstitches, or elaborate color changes to start. Stitch over one thread on silk gauze. Problem: "Just working tent stitch or half-cross is boring." Solution: You can do any kind of stitch on silk gauze, it doesn't have to be tent stitch. And you can use any kind of thread, as long as it fits through the canvas holes or can be couched on top (so, basically, you can use any threads). Patricia Parra is a master at combining needlepoint stitches and specialty threads on fine counts of silk gauze. You don't limit yourself when it comes to stitches and threads on regular fabrics/canvases, so don't box yourself in on silk gauze. Experiment and have fun. Problem: "I'm too messy in my stitching and don't pay attention to a neat back." Solution: Well, that could be a problem depending on the design. If the whole area is filled in with stitches, you can get away with a little bit (but you don't want it to be too knotty to make it bumpy when you frame). When stitching on silk gauze, a neat back is especially important if some of the background is left unstitched, so here are some tips: when starting a thread, try to use an ‘away waste knot’ to begin. You may sometimes be able to end a thread using this same technique, resulting in less bulk on the back of your work. When ending threads by ‘running’ under stitches. Problem: "How do you finish a silk gauze stitched piece?" Solution: Depending on the size of your finished piece, you can put your silk gauze stitchery in jewelry findings (raid Grandma's jewelry box, or search antique stores), ornament frames that you find in craft stores, or in miniature frames that you find in craft stores or independent needlework stores. Kreinik also sells silk gauze already mounted in decorative ornament frames, which saves time and money. 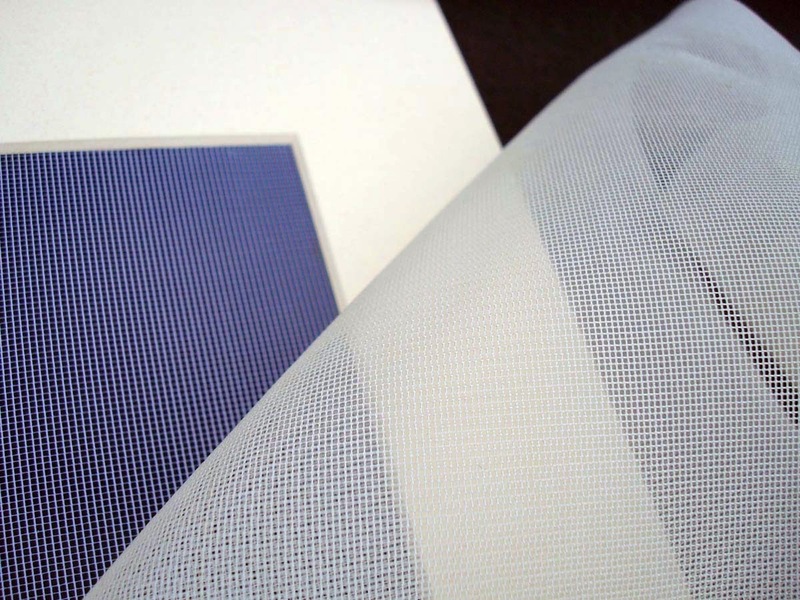 If you stitched your piece in a mat-board frame, either remove the tape holding the gauze, or carefully cut out your piece leaving as much room around the edges as possible. You can trim it later to fit into a frame. Side note: Silk gauze is woven in a leno structure, which interlocks the weft threads making it almost impossible for them to shift, so the edges don't ravel like Aida cloth or linen. Problem: "I can't find silk gauze in my local craft store." Solution: You probably won't find it in a Joann's or Hobby Lobby. So turn to an indie needlework store. Don't have one near you? 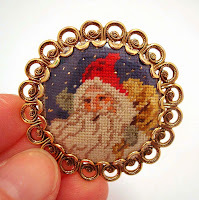 Go to www.kreinik.com or choose your favorite online needlework shop. Kreinik sells silk gauze wholesale to shops either in framed pieces (makes it easy to hold) or by yardage. So as you have all of your holiday projects lined up, swap out the usual fabrics for silk gauze. You will fall in love with the finished result! 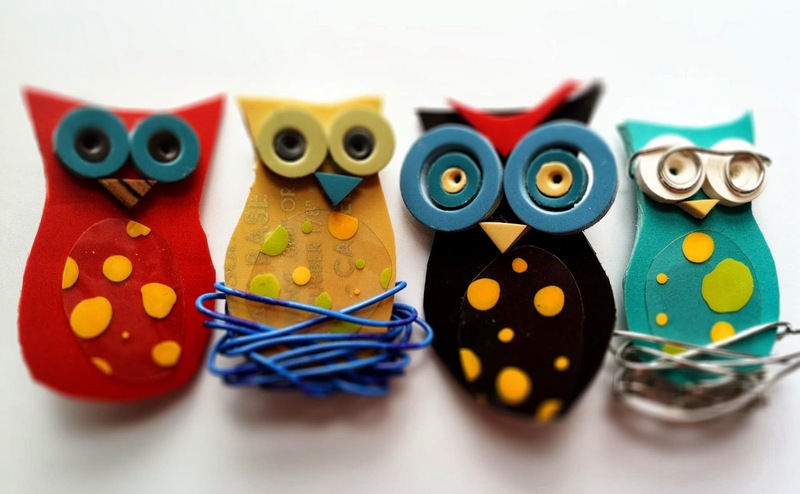 A full day of inspiring craftiness and savvy business talk is coming to town this month, via the Cleveland Craft Connection. We know some of the people involved in organizing this to-do, and they are sharp; we wouldn't hesitate for a second to attend the event, where you can learn both craft techniques and business tips. All the info is below. Oh, and Doug Kreinik will be there, doing a thread demo and serving on the business panel. This is a great opportunity to revel in creativity and come away with valuable knowledge. Cleveland, OH—Cleveland Craft Connection, Cleveland’s exclusive DIY craft gathering, where creative meets business™, is set to launch an annual event on Wednesday, October 23, 2013 at smARTspace at 78th Street in the Detroit Shoreway neighborhood from 8:30 am – 6:30 pm. The day is for like-minded, creative crafters to gather and partake in hands-on sessions, such as knitting, fondant décor and felting, listen to an inspirational luncheon keynote, learn how to launch a creative business or take one’s business to the next level and much more. 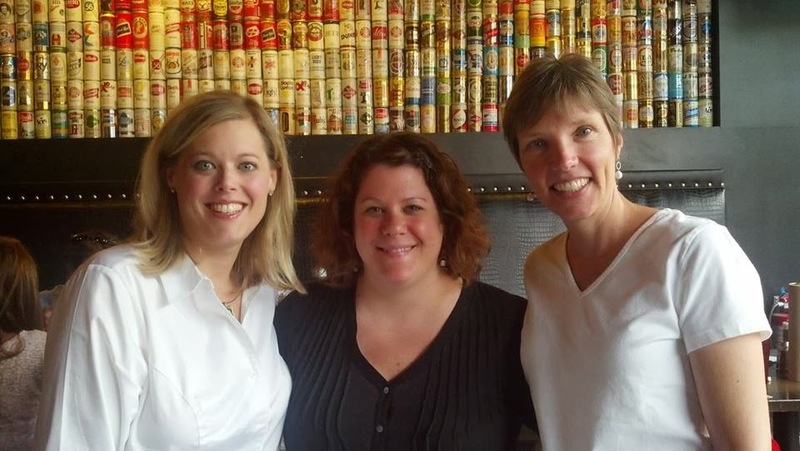 Cleveland Craft Connection’s Co-Founders, Beth Gantz and Tara Tonsetic, are thrilled to be bringing such an innovative and collaborative event to their hometown. “With the continuous growth of the DIY craft movement and the need to satisfy crafters wanting to know more on the business front, we feel we have crafted the perfect blend of creative and business workshops, that in turn will allow attendees to gain knowledge and grow on all fronts,” stated Tara Tonsetic. All event sessions, crafting supplies, breakfast, gourmet boxed lunch, sips & sweets ™ networking, swag tote full of goodies, and access to speakers is included all for $149. Registration is now open at clecraftconnection.com. The day’s event is brought to you in partnership with the help of the following crafty partners: BGSU’s Dallas Hamilton Center for Entrepreneurial Leadership, Cleveland Business Connections Magazine, Craftsy, Detroit Shoreway, Etsy, Indie Foundry, Spa Walden and Stitch Cleveland, to name a few. To learn more about Cleveland Craft Connection and how to get involved or attend, visit clecraftconnection.com.